Use the HTML5 < video > element to add video to your page. You'll build a page using the HTML Table structures you've learned along with a background matting. 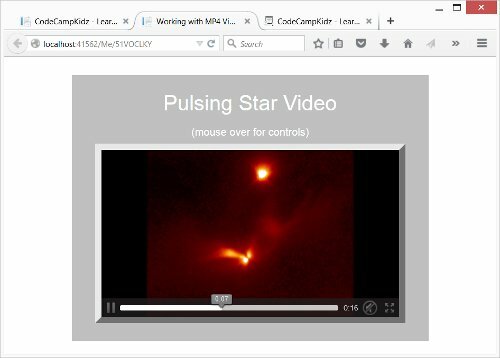 Then you will add a MP4 video clip of a pulsing Star taken by the Hubble Telescope courtesy of NASA/ESA. When you get to the Playroom you can use the File Uploader and a conversion site to add your own video clips to your pages. How to Add the Basic MP4 Video Structure. How to Add Controls to the MP4 Video Clip. How to Add a Video Replay Loop for Continuous Play. Add your own MP4 Video Clip to a page. You will convert a video taken on your phone to a Video clip then use the File Uploader utility to add it to your page.